I have a post coming next week about how to simplify meal planning and prep, and a large part of that process is to have some pantry staples on hand because it cuts down on the amount of time you need to spend grocery shopping each week. And although I do mention some ideas for meals, I don't talk about all the pantry items you would need, since it differs so much for each household. So before that post arrives, I thought I would show you specifically what we keep in our house, which is as minimalist as the rest of my life, but still keeps us well-fed! We like to eat certain fresh ingredients, produce mostly, that require at least weekly trips to the grocery store. But I don't like spending tons of time there every trip, and I don't like buying just as many shelf stable things like beans or quinoa that we would consume in that week. I don't feel the need to have stockpiles like you see on extreme couponing (I don't know about you, but I don't eat any of the stuff that regularly has a coupon attached), but it saves my sanity to only buy these items once a month instead of every week. Coffee and Tea. Of course. Cooking Oils and Vinegars. I don't cook with oils on my own foods, but I do for John, and it's usually just olive oil. I also have various vinegars for things - rice vinegar is for Asian foods, red wine vinegar for salads, apple cider vinegar just because it's good for you. Grains. We always have brown and white rice on hand, John eats it fairly often. For myself, I always have quinoa. And of course we always have pasta, my dad makes the best homemade spaghetti sauce so we have pasta at least once a month. John prefers normal pasta, but I try to pick a healthier option like black bean pasta or pea protein pasta. Soups. I make a lot of soup myself from scratch, but sometimes you need it quick. We keep Mrs. Grass for any time someone is feeling sick, and John keeps cans of his favorites for days when he's home from the firehouse and needs food fast. And this isn't really a soup but we also always have Kraft mac and cheese in character shapes. Always. I'll let you guess who loves making that for lunch on the weekends. Beans. Beans are a large staple of my diet because of the protein, so every meal has some sort of beans in it. Right now I have just black beans, and that's because I used up the pinto and cannellini beans recently. Shelf Stable Produce. Namely onions, garlic, and potatoes. These generally come in bulk when they're on sale and I'll buy what we need for a month. You can put them in almost every recipe you can come up with. Baking Supplies. These almost never get used, honestly, but occasionally we find ourselves needing them. We have brown and white sugar, flour, baking soda and vanilla extract. Spices. We have a surprising number of spices for a fairly minimal kitchen, but we do use every single one of them, I checked. We have: salt, black pepper, cinnamon, nutmeg, chipotle pepper, chili pepper, paprika, garlic powder, onion powder, and a seasoning blend that goes on, like, everything. Nuts and Seeds. I keep nuts and seeds in my desk at work for snacks. I pick a new one each month, usually in the bulk section at Whole Foods, and get enough of what I think I'd eat that month. There are a few things that we use that could be kept in the pantry, but we tend to buy as needed. Soup stock and canned tomatoes for when John makes chili come to mind. 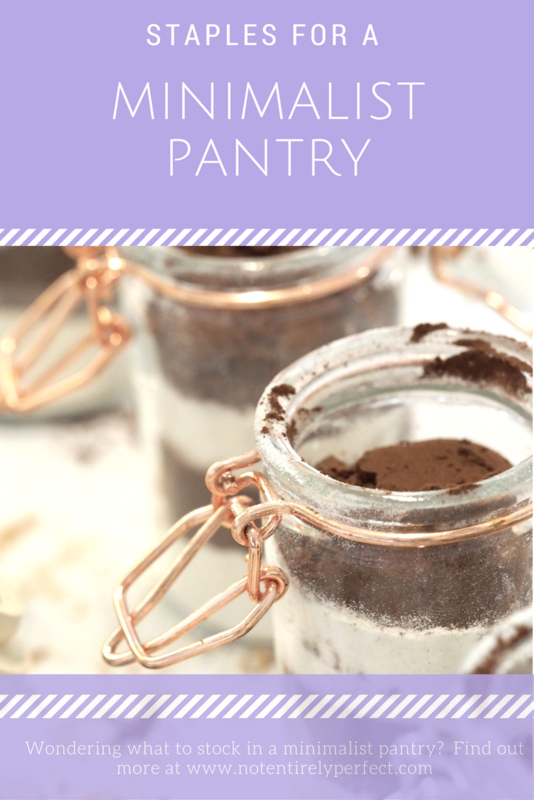 What are your pantry must haves?